Thanks for the feedback. This was based on the first video I looked at. 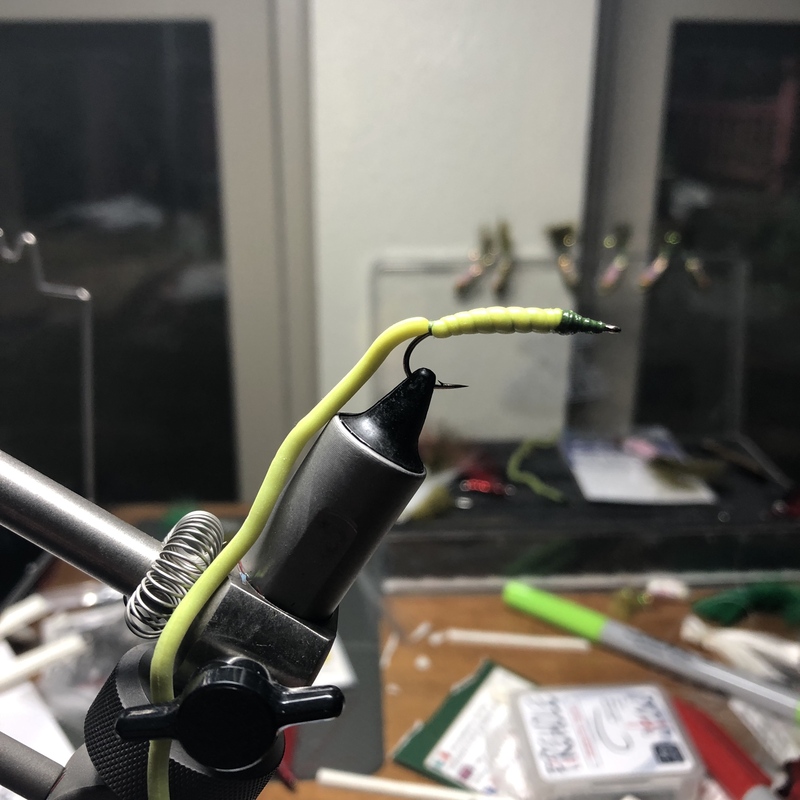 I've ordered some scud hooks to try my hand at some more traditional San Juan worms. I'll give the orange a try. 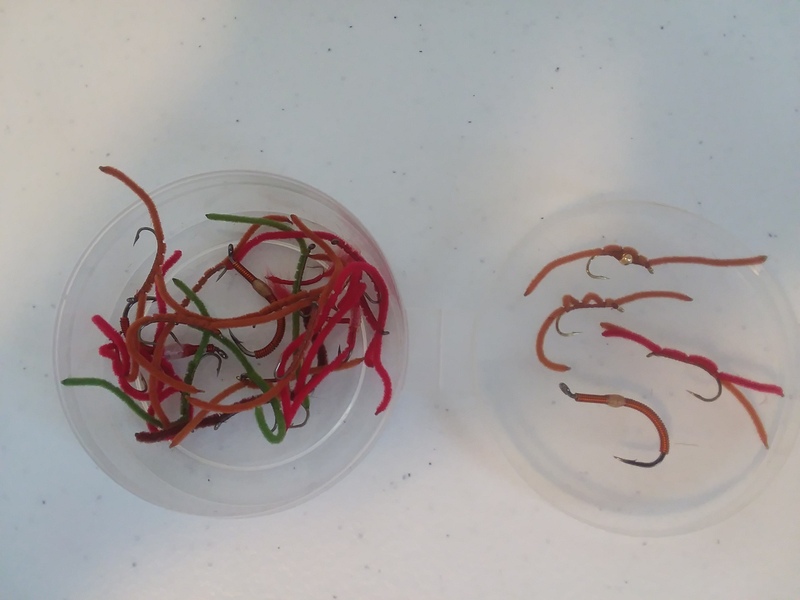 I figured there was a lot of flexibility with worms. My grandson has the most unorthodox approach to using soft baits I've ever seen and usually out fishes me. ... I tie some with two beads on the hook with the worm material humped over the beads and tied on each side. Here's my current cup-o-worms. The ones on the right have a bead, a double hump, a red/brown combo, and an anchor made of wire wrapped on an offset Gamakatsu octopus hook. I've just realized I don't have any orange ones. Like I wrote earlier, they're the most productive for me. I know what I'll tie next time I sit down at the vise and want an easy batch to tie up. Thanks, Fred. The visual helped. FTR - I've never caught anything but the bottom with the wire wrapped Gamakatsus. Dead drift— no tug from the leader to make them fold back on themselves, oh, except maybe now and then. They’ll wiggle in the current like the real thing. And big fish will eat ‘em. I agree with Fred. Well, if they’re in the water, and the fish are eating them, they’re imitations. Like when the bottom is disturbed by spate, or when the flow suddenly goes up in a tailwater. Orange ones on the San Juan, dark purple with an orange “slime tube” on the Bighorn! I’ve always got a mess of them in my tailwater boxes. . . .A lot of fly fishermen won’t fish them because, “I didn’t become a fly fisherman to fish worms!” . . . It's funny, the sorts of rules we set for ourselves. For sure, I'd rather catch fish on classic dries than anything else. Notice I wrote "catch fish", not simply "fish". We all fly fish because of some perfect image in our minds. Beautiful dry flies, tied to beautiful bamboo rods, making beautiful casts, in beautiful places, for beautiful fish is my ideal but I'm not a snob about it. I'll dredge to bottom if that's what the fish want. Some day that may change but today I enjoy the tug. Bloodhound says he just enjoys being out in those beautiful place whether he catches a fish or not. I say if there's not a chance of catching a fish, then you're hiking, not fishing, and a hike is just walking a circle in the woods so what's the point? It's damn near golf! But that's just me. My personal aesthetic stops me short of tying the 'mop flies' that are all the rage these days. But again, that's just me. [EDI]By the way, I stuck the little package you sent me last year with the hanging midges in my pocket before heading out yesterday and they saved the day. The only fish in the net were with one of your flies. It's fun to catch fish on flies your buddies give you. Probably more so for me know than catching them on my own flies. I saved the flies from last years fly swap, but I'm going to use this years picks and report back each time I catch a fish on one. Glad to hear they worked for you, Fred! Just to add a bit...there must be the possibility of catching fish...otherwise, yup its just walking/wading. I have San Juan worms that I tied, in my box, I also have midges and a foam hopper or two and wooly buggers...but I would rather catch one or two fish on an EHC or PMD or a BWO dry fly. BUT and this is the bigger issue for me...I am still a very new beginner to Fly Fishing, so I get excited, when I can control my line, make an accurate cast, fish the same fly(without feeding to the willows) for more than 5 min...so I get a lot of pleasure from being on the water and fishing some beautiful Colorado spots. I tell myself I am getting better each time I go out...and if there is a fish or two that gets caught in the process of my learning...great. I learned a ton from fishing with Fred. He has a great casting motion and read of the waters...and he catches fish! I need suggestions. Anyone have pattern suggestions using these? I’ve found decent uses for the rest of the skin but haven’t found patterns I like for this section. Thoughts? An old man from here in town moved to AZ and an auction company is selling his estate on line. He has a ton of fly tying stuff and jewelry making tools (which will work for some of the stuff I make) so we drove by to view the stuff while the house was open today. I opened one box of fur that has some rank squirrel tails in it. Now that smell is in my nose and on my hands. I've washed a half dozen times and it still lingers. My goop is packed away somewhere in the garage but I think I'll have to go dig it out 'cause this smell is driving me crazy. Haven’t used it in years, but remember it well. I need more grease and oil in my life. Oh man. Good stuff, used to be an intimate part of my daily life. Ok, here’s a question for discussion. Have any of y’all ever tried selling flies? Etsy, EBay, friends and neighbors, shows? There’s a lot of flies I really enjoy creating, but don’t really use. I’m not really picturing making actual money, but if I could support my tying habit, I’d be pretty happy. In the past, I tied locally specific flies (mostly tailwater flies for the San Juan) for the shop. That was before they could get many of our needed small midges and small mayflies from commercial tiers like Umpqua. Now they get all of these as beautifully tied flies on very good hooks and with excellent materials for peanuts. They’re tied in places like Sri Lanka that have ridiculously low labor costs using Umpqua’s own vast source of materials. I used to tie for some of my guide clients - my own patterns that they couldn’t get elsewhere, flies they’d taken trout on when fishing with me. Lolitas. My midge patterns. For one client, parachutes with fluorescent posts (he was very near-sighted) before those were commercially available. Things they’d ask me for. Pink-bodied PMD Sparkle Duns for the Dolores. Etc. I honestly don’t know if I ever would have sold a single fly without a connection to a fly shop and a list of clients accumulated over decades, and this after having my name out there and selling a lot of fishing books and magazine articles. It always seemed like I was making less than a buck an hour after paying for materials. I guess I’d start by asking fishermen I know if they need any flies. Maybe see if a local shop has a need for something they’d let you tie for them. Last edited by durangopipe on Sat Oct 13, 2018 5:01 pm, edited 1 time in total.